There are so many Lingzhi / Ganoderma products being sold in the market. How do you know which one is the best? A easy way to check is whether the Lingzhi you choose has been granted certifications by credible independent third parties. And the accreditation states that your product is both Safe and Effective. 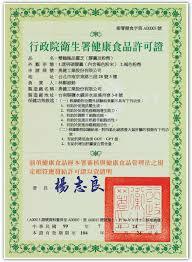 Taiwan is a country with many manufacturers of healthfood products. In the past, unscrupulous manufacturers would make unsubstantiated claims about the abilities and benefits of their products, thereby badly tarnishing the reputation of the country. As such, the Taiwanese government through its Department of Health decided to regulate that, thereby enacting a Health Food Control Act, which came into effect on 3 August 1999. Since then, any manufacturer which wants to claim that its product has certain functions can only do so after obtaining approval and the relevant accreditation under this Act. Otherwise, the parties found guilty can be fined up to NT$1,000,000 or imprisoned not more than 3 years. I now share with you the difficult process of obtaining such an accreditation.. If you like a copy, please email me at askfuiping@gmail.com.